I sat down to write this review and realized I didn’t even know how to begin. I pulled out my notebook, normally filled to the brim with detailed notes about each song. But this time, my notes were sparse, the specifics absent. That’s the effect this show had on me. The Quiet Hollers and Mo Lowda and the Humble — two little-known and criminally underrated indie bands — served as dual headliners. Both played for about an hour, and unlike some other groups I’ve seen at The Ark, they didn’t do a lot of talking in between songs in their set. Instead, they let the music speak for itself. That sentence was a good summation of their set. The band’s lyrics referenced social issues ­— toxic masculinity, the prison-industrial complex — and mental illness. But their sound was loud and full. Their instruments were typical of those used in a rock band, except for one thing: they had a violinist. The violin added depth to many of their numbers, and its parts were often the highlight of their numbers for me. The unique acoustics of The Ark only added to the experience. Watching Mo Lowda and the Humble was like watching a jam session. I’m not sure I’ve ever seen a band get more physically into their music. So it’s no surprise that their instrumental breaks were the highlight of their set. They also varied the vibe of their songs — playing something louder and harder one minute, and a more mellow, acoustic piece the next. The variation added depth to their show. Not all bands can make both loud and soft stuff work; Mo Lowda and the Humble could. Normally, this is the place where I’d describe my favorite songs from both sets or where I’d do in-depth analysis on their structure or lyricism. But that’s the thing. I enjoyed the show so much that the idea that I had to write down the details slipped my mind. By the time I realized, it was too late. I can’t tell you why I enjoyed each part of the set, only that I did. That I enjoyed it so much, I neglected my duties as a reviewer. The thing about music is that it’s easy to get lost in it. Sometimes I sit down fully intending to do homework, but I make the mistake of putting on a good song first. I get wrapped up in the harmonies and carried away by the melodies. And when it’s live, that effect is only magnified. I was sitting there for two and a half hours, my sole job to watch this concert and review it. Take some notes. Remember which songs I liked. But I forgot what music does, and I got lost. And that’s the best compliment I could give. College is a time for doing stupid things, they say. And having done more than my fair share of them myself, I can attest to the highs and lows of adulting. But at least I learned a little about myself in the process. That’s the feeling Pacek and Paul — Michigan students themselves when they wrote the show — knew all too well. And it’s the feeling Edges hits right on the head. Edges is more a song cycle than a full musical with a plot and fleshed-out characters, a show that feels more like an intimate confessional than a Broadway spectacle. Penny Seats’ staging did justice to that. 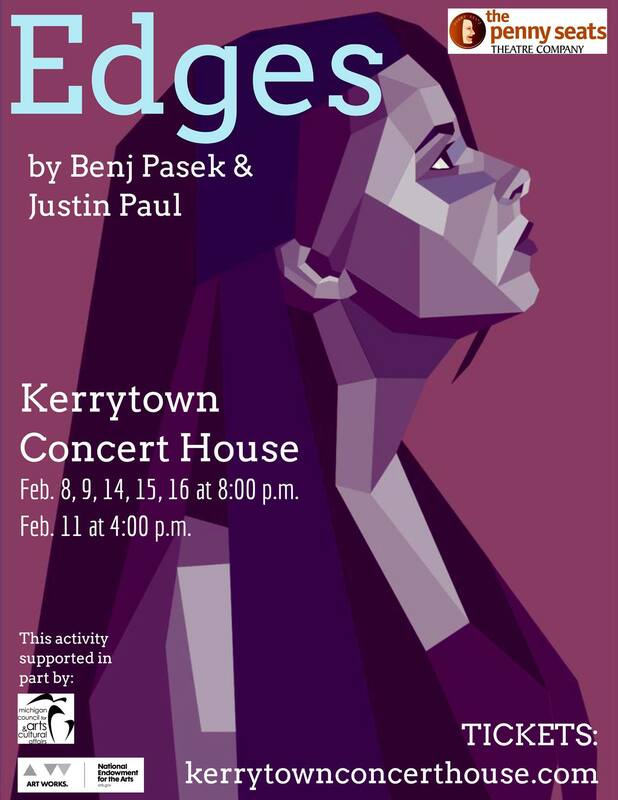 Kerrytown Concert House is literally a converted house, adding to the idea that these characters were more than just written constructs — they could have been any of us. The first half of the show was set up almost like a group therapy session. The only sets were a pair of stools, and when it was each character’s turn to sing, they would take a stool and tell their story as the other actors watched from the audience. This worked with the material of the show, but at the same time, some of the actors sat on the right side of the stage, where there were no audience members and where the majority of the audience couldn’t see. I don’t want to fault the company for working within the confines of their space, but this setup annoyed me slightly throughout, as the actors would be turned to the side at times singing to the other characters, making them hard to hear. Edges operates in two halves — essentially, falling in love and falling out of love. After the opening number (a quintessential “I want” song about being afraid to be who you really are), various characters took their turn singing about all of love’s messy parts. The songs themselves were intensely relatable, but adding to that was the fact that the characters are not given names, adding to the idea that they could be any of us. One highlight was “I Hmm You” — one of the few songs in the first half sung by two characters — which was equal parts awkward and delightful. The actors executed perfectly what it was like to be a 20-something in love. But Edges had its share of emotional numbers as well, my favorite of which was “Lying There.” The song, about lying next to the person you love, unable to sleep wondering if they feel the same way, was resonant and heartfelt. The show’s shift happened at “The Facebook Song,” the first ensemble number since the opener. “The Facebook Song” was hilarious (even if slightly outdated — the number one way you can tell this show was written in 2005 is that Facebook was not only the go-to social network for college-aged kids, it was still called “the Facebook”) and the choreography — where each character held up a cardboard Facebook icon and turned it over to reveal certain postings — only added to the song’s comedy. However, I also felt that the song almost didn’t belong in the show. The other numbers, while not necessarily connected, showed a clear arc, but “The Facebook Song” seemed to not fit in with that arc. It seemed almost as if it were in the show as a marker of sorts between the first half and second half. However, “The Facebook Song” brought down the house and for good reason, so I’m loathe to say it didn’t belong. In the second half, the audience learns that the relationships set up in the first half haven’t been going well, as the various characters come back onstage and sing an array of breakup songs that are at times hilarious and heartfelt. Actor Emily Manuell — who nailed the emotionally-resonant “Lying There” in the first half — was given a complete change of pace in “In Short,” a number about all the ways she wished the person that once kept her awake would just die. She nailed the comedic timing of the piece, another showstopper that left me laughing out loud. The show wrapped up with another ensemble number where the characters come together saying they’re ready to be loved again. They’ll likely go through all the same feelings again, but at least they’ll be better for it. And that’s where the show packs its real punch. At times, Edges was almost painfully relatable, eliciting uncomfortable laughter and the kind of awkwardness that’s funny because it’s real. That’s how you know they nailed it.